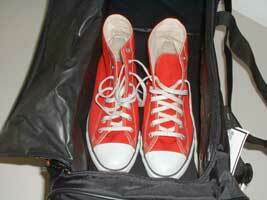 Monarch Luggage of Brooklyn, New York was licensed to manufacture Converse All Star sports bags. The ChucksConnection has some of these tote bags available for sale. This is a athletic tote bag measuring 18 3/4 inches wide by 10 1/2 inches high by 9 1/2 inches deep. There is a large square Converse All Star logo on the side, and a Chuck Taylor logo on the side. The bag includes an adjustable shoulder strap and a comfortable handle wrap with velcro closure. There is an extended U shaped zipper entry into the main compartment and a mesh side for ventilation. The tote bag is made of very strong nylon. 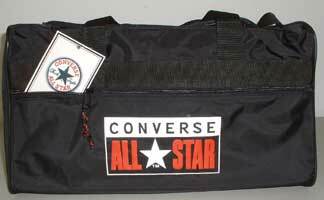 The side view of the Converse tote bag has the Chuck Taylor logo and the interior has plenty of room for one or two pairs of chucks and shorts, sox, or other clothing. The totebags come in three color combinations: black with red and white trim, black with a hunter green top panel and red and white trim, or black with a blue top panel and red and white trim. 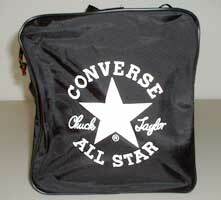 To order a Converse All Star Chuck Taylor tote bag, click on the appropriate link. Add a Black with Red and White Trim Totebag to Shopping Cart. Add a Black/Hunter Green with Red and White Trim Totebag to Shopping Cart. For additional duffle bag selections, for men, women, or kids, click on the Eastbay link to the left. Under Shop By Department, select Equipment then Bags. This will get you access to dozens of bag choices by style, brand, gender/age, sport, league, price, color, or product rating.